As you may know, here at Real Pickles we are deeply committed to buying our vegetables only from Northeast family farms and selling our products only within the Northeast. One way in which we are able to achieve this, and in turn help to build a strong, organic and regional food system, is by working with small independently-owned regional distributors who bring Real Pickles to our Northeast neighbors. With this in mind, we began partnering with Myers Produce in 2016 as a way to bring our ferments deeper into the urban areas of the Northeast, and we’ve been thrilled with the results! 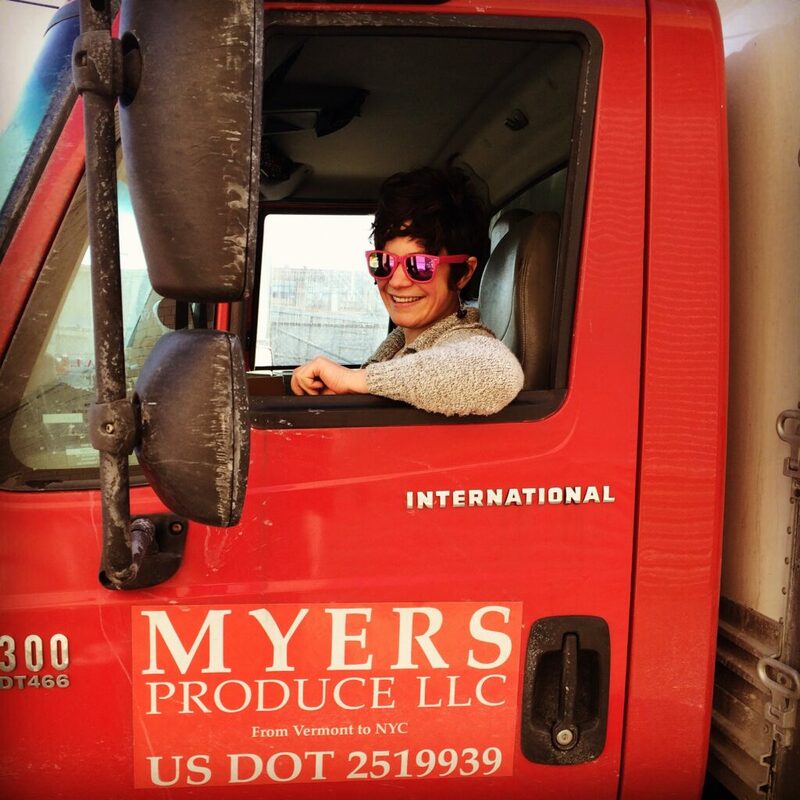 Myers Produce has been in operation since 2013. As a regional distributor based in Vermont, they buy vegetables and value added foods primarily from small, mostly organic farms in Vermont, Massachusetts and Maine. They then truck and sell to stores and restaurants in the New York City and Boston areas. Everything they offer has been produced in the Northeast. It’s a beautifully closed loop! 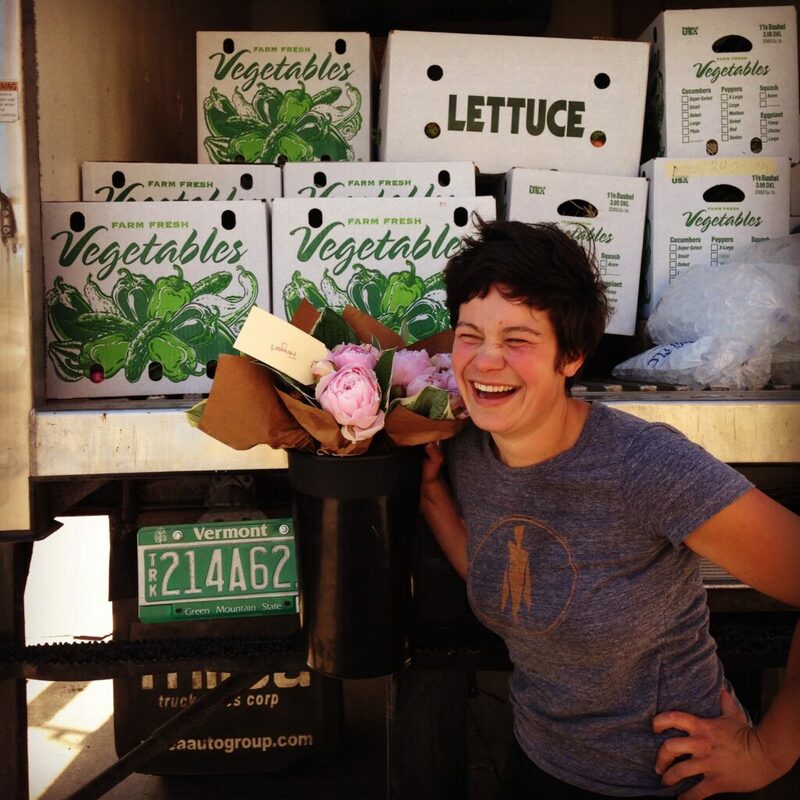 I recently chatted with Annie Myers, owner and founder of Myers Produce, about her experience delivering delicious regionally-grown food to cities in the Northeast. Read about it here, and let us know your thoughts on how regional food fits into your life. AM: When we started, the business consisted of me, a van, and a computer, and I was delivering exclusively to NYC customers once a week. We have grown a lot since then! 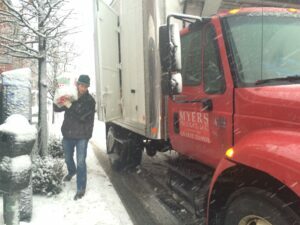 We are now a team of ten employees operating four box trucks. Our mission has remained the same since the beginning – we work to increase Northeast farmers’ access to regional urban wholesale customers, in order to support the strength of agriculture and the regional food system in the Northeast. AM: We have a much less diverse list in the winter than we do in the summertime. We don’t source any products from outside the region, so as soon as a product goes out of season in the Northeast, it is no longer offered on our list. That said, many of our farmers do an amazing job of season extension, and our winter offerings are probably more diverse than you might expect! We have greenhouse-grown spinach, tomatoes, and cherry tomatoes year-round, and we generally have kale, fennel and leeks well into January. And we have added value goods made with locally-grown produce available as well, like products from Real Pickles! AM: We don’t know the answer to this entirely, but I think we have prioritized efficient systems, clear communication, and good customer service from the very beginning. I know these things mean a lot to our farmers and producers, and to our urban customers. AM: We don’t have an exact formula, but we try to keep our list diverse and to offer a consistent high quality. We try to source the products that we consider to match growers’ strengths, while also balancing location, price point, seasonality, and scale. AM: I know that all of our customers are constantly competing with huge corporate sources of food (Amazon/Whole Foods in particular), and that they are challenged to differentiate themselves in the eyes of consumers. I think the most important thing is for shoppers to be intentional about where they spend their money, and think about who they are supporting by where they buy their food. If we want to support local growers in the Northeast, we need to make sure to spend money where it will stay in regional circulation. AM: We really only have one physical warehouse space. But, to cover the distances we cover while adhering to regulations – and also create jobs that we think are sustainable – we have drivers based in NYC, Western MA, and VT. All of these drivers start and end their days in the same locations, but they drive from VT to Western MA and back, from Western MA to NJ and back, from Western MA to VT and back, and from Western MA to Boston and back. AM: I have always loved puzzles, and I’ve grown to enjoy creating systems that are physical, flexible, efficient, and full of moving parts. I love it when an opportunity or inquiry comes up on a given morning, and I get to think about how that opportunity fits into our current operation, send a few emails, make a few phone calls, and be able to take advantage of that opportunity (often by the next day) in a way that makes sense for all parties involved. 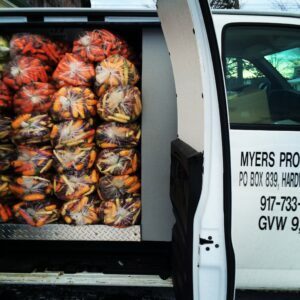 It keeps me on my toes, and it helps me feel that Myers Produce is providing a real service that can adapt to the needs of the folks that we are trying to serve. Where should we get our food from? How far need it travel? These are essential questions for anyone who wants a better food system – one that is ecologically sound and socially just. After all, a big impetus for the rapidly growing movement to transform the food system is the modern-day reality that places like New England – quite capable of raising such crops as apples or tomatoes – will instead import them from thousands of miles away and burn up large quantities of climate-changing fossil fuels in the process. Long-distance food transport brings other drawbacks, too. By getting our food from California or New Zealand, we’re often giving up on flavor and nutrition because those distant farms are growing crops that were bred, first and foremost, to be shipped. Farms supplying national or global markets also tend to become big and concentrated, and thus are more likely (organic or not) to be engaged in industrial, monoculture practices, rather than the kind of agriculture that supports healthy soil, healthy crops, and healthy ecosystems. And, of course, eaters in this kind of food system are left hopelessly disconnected from the source of their food, which brings all sorts of unintended consequences. Buy local! This has been a primary response to the crazy, unhealthy, industrial food system we have in this country. Leave behind that bad supermarket food shipped in from who knows where, and go get to know your neighborhood farmer. The push to buy local is taking the burgeoning new food system far. Countless farmers markets and community supported agriculture farms have come into being. More and more restaurant chefs are buying ingredients from local farms. Local food has even begun to make its way into schools and hospitals. The idea of buying local makes sense in many ways. If our food system is broken and a central problem is that we’re sourcing from thousands of miles away, the obvious response is to switch to getting our food from as close to home as possible. And if the disconnect between farmers and eaters is a serious problem, we should start buying our food from a farmer who we can actually meet face to face. There’s a logic to it, and this indeed is an important part of the solution to building a new and better food system. Is “buy local”, however, the end of the story? Is the right way to create the food system we need to buy as local as possible every time? It’s an increasingly popular idea. These days it serves as the basis for commissioned studies and marketing slogans suggesting that single small states – even single towns – might feed themselves almost entirely. But, I think the real answer is more complicated. A trip to a pickle festival in New York City a couple of years ago got me thinking about the issue in a new way. Addie Rose and I traveled to the Lower East Side to set up the Real Pickles booth at the Peck Slip Pickle Fest, a special one-day event at a public food market called New Amsterdam Market. During a short break between pickle sales, I got a chance to walk the market, and was struck by how different it was than the farmers markets back home in western Massachusetts. In rural western Massachusetts, farmers and other food producers typically travel ten or twenty miles to get to a farmers market. 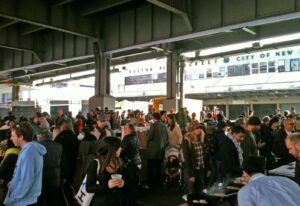 Here at New Amsterdam Market, I noticed that the vendors – vegetable farmers, cheesemakers, maple syrup producers – were coming from a much greater distance. Some had driven 100 miles or more from various points in the Hudson Valley. Others had traveled even further, coming down from the Finger Lakes or Northern Vermont. There were a few vendors with products made in Brooklyn, but few if any were using agricultural ingredients produced local to the city. None of this came to me as a real surprise. A place like New York City – with its urban development stretching for many miles – obviously can’t support many real farms anywhere close to its borders. But, it got me thinking about all the talk about being a “locavore” and switching to a “100-mile diet”. For those of us living in rural places like Vermont or the Berkshires or Maine, it’s remarkably easy to become convinced that solving our food system’s problems can be wholly accomplished by the act of buying as local as possible – and organic – in an effort to create a multitude of insulated, local food systems. And, yet the point of changing the food system is not to create an elitist alternative for a limited subset of the population. The point is to bring about a transformation that gives everyone the opportunity to participate in and benefit from a healthy, just, and sustainable food system. If everyone is to be part of the new food system, then I think we need to keep this fact in mind: the majority of the U.S. population lives in concentrated urban areas whose local agricultural resources are entirely inadequate to support the food needs of their populations. For those in and around cities, then, the task of sourcing food from much closer to home means re-building the food system on a regional level. Instead of local food systems with a 100-mile radius (as many choose to define “local”), this means focusing on regional food systems with, perhaps, a 250- or 500-mile radius. Those of us in rural areas – rich in agricultural resources – thus have an inescapable responsibility. As we do the necessary work of helping to overhaul the food system, we must consider what part we can play in feeding the populations of places like Boston, New York, and Philadelphia. While it is surely tempting (and so much simpler) to focus inwardly and exclusively on how to feed merely ourselves, that is not, in the end, the way to build a better food system. It is essential to be actively promoting and supporting our local farm economies – and, at the same, we need to be thinking more broadly. There’s another strong reason why we need to think regionally as well as locally, one that undermines the notion that it would even be possible for any one town or small state to securely depend on its own agricultural resources. It has to do with things like weather and pests – those unavoidable factors that make farming inevitably risky and unpredictable. Factors which also threaten to make farming even more unpredictable as a result of climate change. The changing pattern of cucumber growing here in the Pioneer Valley of western Massachusetts helps to illustrate the issue. Dave from Chamutka Farm in Whately has been growing pickling cucumbers (among other crops) since 1980. Before that, as a kid, he helped out his parents and other local growers raise them for the old Oxford pickle plant in nearby Deerfield. Dave, who was Real Pickles’ first cucumber supplier, has witnessed the harvest season for local pickling cucumbers shrink dramatically in recent years. When he first started growing, he could harvest cucumbers all summer long, typically going into mid to late September. By the time Dave started supplying cucumbers to Real Pickles in 2001, cucumber harvests would last at least until early September. Over the last decade, however, it has come to be a crapshoot to expect a harvest beyond mid-August. For Real Pickles, that means pickling all of our cucumbers for the entire year (60,000 pounds in 2013) within a single six-week period. What’s steadily squeezing out our local cucumber season? It’s a disease called cucurbit downy mildew, which blows in from the southern states each summer and, just about overnight, wipes out the cucumber crop. These days it’s showing up much earlier than it used to, a trend that is likely to continue as the climate warms. As UMass Extension vegetable specialist, Ruth Hazzard, explained to me recently, human attempts to breed cucumber plants resistant to it have been failing to keep up with downy mildew’s rapid evolution via genetic mutation and natural selection. In the future, cucumbers could become a much less reliable local crop. And yet, as downy mildew does not typically reach all parts of the Northeast (check out these maps illustrating its recent impact), it may still be a reliable regional crop. Differences in weather (and its effects) from one locale to another point us in a similar direction. Tropical Storm Irene barreled through the Northeast in August 2011 and brought epic amounts of rainfall. Small rivers flooded immediately, and within a few days, major rivers started overflowing their banks – leading to crops losses for numerous farms located along riverbanks (where the best soil is). Three of the six farms that regularly supply Real Pickles had flooded fields and ruined vegetable crops. It was a disastrous event for many farmers – though not for all farmers in the region. For one thing, Pioneer Valley farms located on higher ground tended to fare better during Irene. Looking regionally, the storm was a disaster for farms in such places as Vermont, the Hudson River Valley, and western Massachusetts. But, farms in many other parts of the Northeast – further from the track of the storm – emerged relatively unscathed. Last season, farms in our area had to contend with one of the rainiest months of June in memory. About ten inches of rain fell here in the Pioneer Valley that month, adversely affecting our local food system in a variety of ways. The direct effect on Real Pickles was that 20,000 pounds of summer cabbage that we had planned to buy from one of our local farms rotted in the sopping fields. While our local farms had all experienced similar weather, farms in some other parts of the Northeast had not. The same week that we got the local cabbage news, we received a call from our friends at a farmers co-op in Pennsylvania and learned that organic farmers down there had produced a bumper crop of summer cabbage. We bought enough to fill up a tractor trailer – making the transport as energy efficient as possible – and were able to make the batches of sauerkraut and kimchi that we needed. These examples all drive home the same point: While a global industrialized food system is clearly not a resilient one, neither is an entirely local one. If we are to build a better food system, resiliency must be among its central features. The inevitable conclusion, then, is that we need to make a shift toward regional scale. We must move away from the hopelessly unhealthy, inefficient, and insecure reality offered by our current global food system. And we also need to properly account for the impacts of weather, pests, and climate change – and do our best to ensure that everyone can be reliably fed. The work of building the new food system that we need involves a wide array of priorities – like reducing corporate dominance, expanding organic production, and shifting to healthy, minimally processed foods. Cutting back dramatically on long-distance food transport is another top priority. Here, we need to engage in food system development on two scales: local and regional. How do we do this? 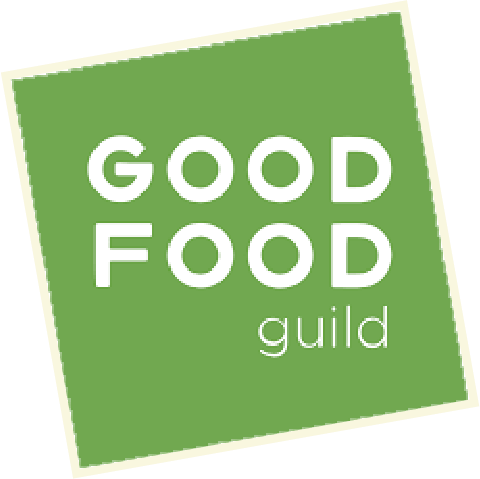 CISA recently put out a fantastic guide, Eat Up and Take Action for Local Food, outlining all the many ways one can help build up our local food economies. Buy locally-grown food, support access to it for low-income folks, become a local foods entrepreneur, invest in a local foods business. There is plenty of important work to be done. On the regional level, a key task is to build up the regional connections between farms, processors, distributors, retailers, and eaters. At Real Pickles, we enjoy working with and supporting three family-owned distributors – Angello’s, Regional Access, and Associated Buyers – all of whom do a great and efficient job of connecting Northeast family farms and producers with retailers throughout the region. (I mention “efficient” because regional food distribution can, in many cases, outcompete local food distribution when it comes to minimizing energy consumption, a key consideration.) We also make a point of keeping in touch with Northeast farms outside the Connecticut River Valley, so that we are prepared whenever those inevitable weather challenges arise. 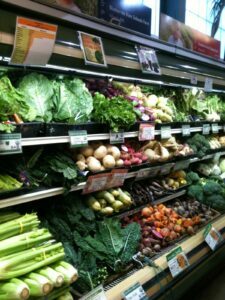 We primarily buy our vegetables from local farms, but we can turn to Pete’s Greens in Vermont or Tuscarora Organic Growers in Pennsylvania if we need to. Encouraging retailers and eaters to support local and regional products is important, too. For years now, “buy local” marketing campaigns have been successfully raising awareness about the benefits of supporting local farms. It may be time for “buy regional” campaigns, as well. At Real Pickles, we honor our original commitments to buy our vegetables only from Northeast family farms and sell our products only within the Northeast. This is our way of publicly promoting the idea of regional food systems. We would love to see many more food businesses making similar commitments! If we want a better food system, then we must be sourcing our food much closer to home. The food system is complex, however, and simple prescriptions will only take us so far. Responding to the reality of global food transport with the call to “buy local” is extremely important. If, however, we are to truly to change the food system – the whole system, not just the margins of it – we must also develop a regional perspective. By doing so, we will help to ensure that our food system can be healthy, secure, and sustainable. And that it can be so for everyone! NOTE: If you’re interested in learning more about regional food systems, I recommend checking out the work of Northeast Sustainable Agriculture Working Group (NESAWG). In particular, you’ll find excellent in-depth papers on the topic here and here. For a number of years now, NESAWG has also been helping to build a Northeast regional food system through their annual conference, It Takes a Region. At Real Pickles, we have always had an unconventional approach to distributing our fermented vegetables, choosing to work with small independently-owned regional distributors rather than large national ones. Angello’s Distributing, based in upstate New York, was the first distributor to carry our products. I recently talked with Joe Angello, its founder and owner, about his experiences in the natural food industry and what it’s like running a regional distribution business. KH: Why did you decide to start a food distribution business? JA: It was a reaction to the consolidation of natural food distribution. Northeast Cooperatives had just been purchased by UNFI [United Natural Foods] and a clear monopoly was being established. We were recognizing that good local producers had no access to the market. The only way was through UNFI and they were more focused on national brands. I didn’t spend a lot of time on a business plan. If I did, Angello’s might not have happened. I’m more of a jump in and do it kind of guy. I borrowed a truck and was working out of the cooler at Hawthorne Valley Farm. Later I found space at Clermont Fruit Processors in a building that had been in agricultural use for over eighty years. KH: What does Angello’s look like now? JA: We have fifteen staff people, both full and part time. We run two to four trucks. Produce wasn’t our original intention but we started the business at the height of the season and within a month it became obvious that people were interested in fresh, local produce. I came from fifteen or twenty years in the fish business. Fish is expensive and perishable and the intensity level and competition is high. Produce can be hard but it’s easier than fish and we really worked on how to make it as fresh as possible. Produce accounts for about 40% of our sales now. 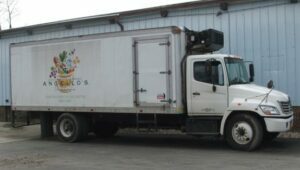 We also distribute dairy, grass-feed beef, baked goods, fermented foods and some beverages. Our core customers are independent natural food stores and co-ops in the Hudson Valley, North Jersey and the Berkshires. What we do resonates with the end user customer. Shoppers really look for and appreciate good quality organic foods. KH: Angello’s has been distributing Real Pickles since 2004 – before my time at Real Pickles. How did Real Pickles and Angello’s first start working together? JA: One day in the early days of Angello’s I ran into a guy I knew doing a delivery. He had been the Northeast Cooperatives delivery guy when I had worked at the Hawthorne Valley Farm Store. He was grumbling about the UNFI purchase and I said, “Come on over. We could use some help”. It was a rough time in our business. I think he might have introduced us to Real Pickles. He definitely introduced us to Paul Harlow at Westminster Organics. Real Pickles and Angello’s stand for the same thing on different parts of the food chain. It’s one of the brands we’ve had from the beginning that keeps carrying on, and the relationship keeps get stronger. KH: What do you see as the biggest challenges for independent and regional food producers and distributors? JA: Marketing is one of our biggest challenges, both for producers and distributors. We go head to head with major corporations like General Mills and Kraft Foods, who have an unlimited amount of marketing money. Most all of these companies are giant publicly traded stock companies. Is that really where we want our food dollar to go? Those of us who work in regional food all need to be looking at ways to pool our interests so that we can better promote the independent brands that get passed over by the big guys. KH: What do we need to be thinking about as consumers and shoppers? JA: We need more public scrutiny about what’s inside the package. People like Michael Pollan have been doing that and Vandana Shiva has been doing it on a global level. We need to make high quality food a priority – for the health of our environment, the health of ourselves, the health of the economy. The idea that cheaper food is better food is deep in our psyche. That has got to get thrown out the window. If you spend an extra twenty cents on a six ounce yogurt to buy yogurt from a dairy in your region rather than from a multi-national brand, where is that money circulating? How is it impacting our society, the environment and where we live? What’s really happening? These are important questions to ask. KH: Is there anything else interesting about Angello’s that we might not know? JA: We care about these issues at the international level too. We’ve been importing chocolate from the Grenada Chocolate Company. The chocolate bars are actually made by a cooperative in Grenada. Extreme things like child labor and slave labor happen in the chocolate industry, particularly in the Ivory Coast which produces 40% of the world’s cocoa supply. There’s a great documentary called Nothing Like Chocolate that looks at these issues and features the positive things being done by the Grenada Chocolate Company. KH: What has changed in the industry since you started the business? JA: When we got started there was not much of a consciousness or awareness of local food. We didn’t recognize it as a trend. It’s not why we started. For us it was more common sense. All this stuff is here and you can’t buy it in the stores. It didn’t make any sense. We were in the right place at the right time. There was more awareness starting around 2005. Banks still had money so we were able to buy our building. We couldn’t do that now. People started to be really interested in local. Have you been into a Walmart recently? Everything says “local”. Banks and insurance companies talk about being local. It’s like the word “natural”. It gets to be ridiculous. KH: What should we know about food distribution that we probably don’t know? JA: What appears at face value to be a simple task of getting a jar of pickles from Greenfield, MA to Clermont, NY to getting to a retail shelf in New York City is extremely complicated. There are so many ways for that not to happen. We’ve been doing it well and doing it continuously. Giant companies have done a good job of keeping their costs at a level that is hard to maintain at a smaller scale like ours. It’s more difficult than I think people realize. Big corporations are a central part of modern American life: We buy an overwhelming proportion of our goods and services from them, we absorb their advertisements nearly everywhere we go, we invest our retirement savings in them, and we depend on the latest twists and turns in their average stock values to tell us whether our lives are headed in the right direction. These institutions have brought us many material wonders, to be sure. But what, we might ask, is their collective impact on our pursuit of loftier goals? Does the dominance of big corporations in our society, for example, make it harder to achieve sustainability, social justice, or true democracy? Might it be that such institutions actually put these kinds of social achievements fundamentally out of reach? If so, what can be done? In the aftermath of two recent federal court decisions – both, as it happens, ultimately threatening to impact a western Massachusetts food business like Real Pickles – I think these are questions worth exploring. 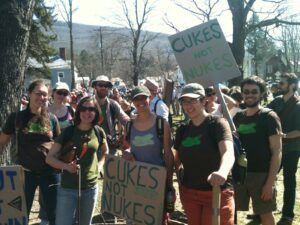 A couple weeks ago, many of us on the Real Pickles staff traveled to nearby Brattleboro, VT, to protest the continued operation of our neighbor, the Vermont Yankee nuclear power plant. With our “Cukes Not Nukes!” protest signs, we joined over 1,000 people in marching to the local headquarters of its absentee owner, New Orleans-based Entergy Corporation, where 130 people were then arrested in a non-violent civil disobedience action. There have long been plenty of good reasons to shut down VT Yankee. The question of how to responsibly manage its waste seems hopelessly unanswerable, given the million-year duration of its radioactivity. And, a major failure at the reactor could make a sizable portion of New England uninhabitable for thousands of years. While such a prospect was real even when VT Yankee first went on-line in 1972, it has become ever more possible as the reactor has grown older and experienced a longer and longer list of mishaps. In recent months, however, another reason to protest has come to the fore. And, that is the extreme level of corporate power revealed in the decision-making process about VT Yankee’s future, as well as a corresponding failure of democracy. VT Yankee’s original 40-year operating license expired on March 21 (the day before the march). But, unfortunately, rather than now heading toward decommissioning, VT Yankee continues to operate. Last year, in the midst of an unfolding nuclear disaster in Japan, the federal Nuclear Regulatory Commission (NRC) granted a 20-year license extension, a lucrative prize which Entergy worked for years to obtain. How could the NRC make such a decision? After all, VT Yankee is the very same reactor model as those that failed at Fukushima. Serious problems continue to plague VT Yankee, and the consequences of a major accident there would be profound. It is difficult to view the result as anything other than the undue influence of a powerful energy corporation faced with the opportunity for massive financial gain. Perhaps, a “corporate mind-set” was at play, as well – a phenomenon which leads people to have outsized faith in corporations to bring about positive societal outcomes. I view the corporate mind-set as a consequence of big corporations’ pervasive influence in society. In January of this year, even more serious questions about democracy were raised when a federal court invalidated the state of Vermont’s decision to deny Entergy permission to continue operating the plant beyond March 21. The NRC had given its permission, but Entergy had previously signed a contract with Vermont agreeing it also would need the state’s go-ahead to keep the reactor going. After a long public debate during which it was firmly established that the clear majority of citizens wanted VT Yankee shut down, Vermont’s legislature sided with the citizenry. But, Entergy sued. It hired a team of superstar lawyers, spent millions of dollars, and – in a wildly off-base court decision – won. Vermont has appealed the decision. For now, however, corporate power has won. And the inhabitants of New England remain at risk. Another recent court victory for a big corporation raises many of the same questions as the Vermont Yankee story. It also hits particularly close to home for an organic food business like ours. This case involves Monsanto, the world’s biggest marketer of genetically engineered seeds. Nuclear power is a very risky business, though its risks are fairly well understood. With genetic engineering, the risks are similarly great. Yet, it’s hard to even predict all that could go wrong. The problem is this: our understanding of living organisms is insufficient to warrant messing around with their basic genetic structure in this way. Living organisms are highly complex. To think that inserting a fish gene into a tomato will not produce a long list of unforeseen effects is naive and dangerous. Will new carcinogens or allergens be created? Will the plants cross-breed with wild plants and then undermine the health of our ecosystems in some unexpected way? It turns out that such things are already beginning to happen. To fully understand the impacts of genetic engineering could take decades, by which time it will be far too late to rein in this technology. It is a serious problem that the federal government has essentially decided that any and all genetically modified organisms (GMOs) are safe and require no testing, raising the question again about the influence of corporate power on our government. The most recent win for the biotech companies is just as troubling. Last year, a coalition of organic farmers, seed companies, and advocacy organizations decided to challenge Monsanto for its aggressive actions against farmers whose crops have been contaminated by Monsanto’s GMOs. The contamination happens when GMO pollen gets carried by wind or insects onto other farms, and then cross-pollinates with non-GMO crops. Farmers who have never purchased genetically modified seed suddenly find GMO crops growing in their fields. GMO contamination threatens the existence of organic agriculture – and poses huge threats to all agriculture. One would expect farmers to have legal recourse against the biotech companies. After all, these corporations are clearly guilty of “genetic trespass”, robbing farmers of the organic or non-GMO status of their crops. In actuality, Monsanto has, for years now, been harassing and successfully suing farmers for patent infringement whenever their GMOs are found in those farmers’ fields. It has made no difference that the farmers neither planted Monsanto’s seeds nor wanted them in their fields in the first place. In response, the group of farmers, seed companies, and non-profits filed a lawsuit against Monsanto, preemptively seeking protection from patent infringement should the farmers represented ever find their crops contaminated by Monsanto’s GMOs. Monsanto hired a team of top lawyers and fought back hard. In February, the judge threw out the case, ridiculing the plaintiffs for a “transparent effort to create controversy where none exists.” The case is now being appealed. One is again left to wonder about the prospects for a society where corporate influence is so pervasive. Is there another path? Is an economy dominated by big corporations the only way? My opinion is that it’s time to dig out that old classic, Small Is Beautiful: Economics as if People Mattered (1973), and consider the advice of E.F. Schumacher: “Today, we suffer from an almost universal idolatry of giantism. It is therefore necessary to insist on the virtues of smallness.” Forty years later, “bigger is better” remains the conventional wisdom. Yet the evidence tells us that bigger is not always better. Increasingly, the idolatry of giantism brings us to a place in which profit-driven corporate influence wins the day, regardless of what ordinary people want or need. If we instead want a society run by the people, many changes are needed. Among the most essential is a shift from an economy dominated by big corporations to one oriented around small businesses (especially those with democratic structures, like cooperatives). In a corporate-dominated economy, corporations hold the power. In an economy predominantly made up of small businesses (even if big businesses still exist), it is possible for people to determine the direction of their lives, and of society. We are no longer battling the excessive influence of big business on government decision-making processes, nor the pervasive “corporate mind-set”, nor the effects of all that slick advertising. What happens when businesses misbehave, acting against societal interests? Small businesses can be held responsible for their actions; in a corporate economy, the big corporations always seem to evade true accountability. Small businesses are less likely to misbehave in the first place. Only a huge absentee corporation – headquartered 1,500 miles away and beholden to the financial interests of investors on Wall Street – could possibly fight so hard to keep Vermont Yankee running. To move to a small business economy, we will need entrepreneurs starting up new small businesses – and keeping them small. Customers supporting these businesses with their purchases. Millions moving their money out of the big banks and into community banks. Investors shifting their money from Wall Street to local and regional enterprises. Masses of people pushing for political change thru protest movements like Occupy Wall Street. In other words, we must choose to make use of the people power we do have, however limited it may be. We will then see that we have what it takes to build a green, socially-just, and democratic society. Here in western Massachusetts, we are fortunate to be part of a community brimming with exciting efforts to build a new and better food system. Farms of all kinds are starting up or heading in new directions: offering winter CSA shares, doing on-farm cheese or yogurt production, growing grains and selling them to local bakeries. Non-farm businesses are using more local ingredients in their restaurants or using them to produce value-added foods like salsas, meads, and (in our case) fermented pickles. New retail markets are forming for local/regional foods, such as winter farmers’ markets and a new food co-op. Non-profits are doing tremendously valuable work, as well, whether encouraging people to “Be A Local Hero, Buy Locally Grown” or running an incubator kitchen for start-up food businesses. To someone like myself who sees enormous social value in transitioning to a regionally-based, organic food system, these developments are very encouraging. And, of course, such activity can be found in many other communities around the country (and beyond), not just in western Massachusetts. In my view, this is an approach to social change that can produce substantial progress. Small farm and food businesses create the building blocks for the new food system. People generate increased market demand by choosing to buy their products. Non-profit organizations help in all sorts of ways. The momentum starts to build as more people come to be exposed to the benefits of a regional, organic food model–as more people get to taste the really good food it puts out, as they see the farms in their communities beginning to thrive. And in time, people can even come to perceive a new food system taking hold (at least at the margins), and imagine the possibility that the corporate, industrial food system could truly be replaced. But, while this work on a local/regional scale to start building the replacement for the current food system is hugely important (I would not have started a pickle business if I thought otherwise), I don’t see a true transformation of the food system happening by this avenue alone. We also need something like…well, the Occupy movement. A key challenge in trying to change the food system is that our political-economic system offers enormous advantages to the purveyors of industrial food. The result is that the big food corporations can sell their products for extremely low prices. 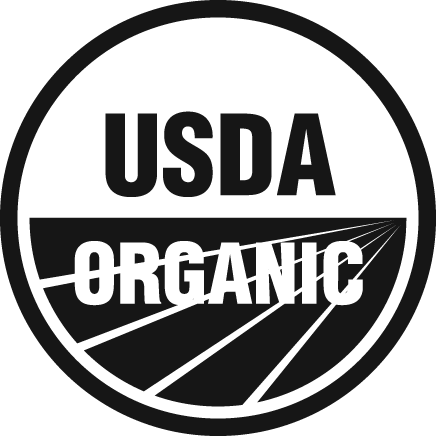 With healthy, regionally-produced, organic food made to look expensive in comparison, it becomes difficult to compete. Those who see the benefits–and have the ability to pay–will buy regional, organic food. But, as long as we have a cheap food system, local efforts to change things will only be able to convince so many people to switch to the good stuff. Of course, cheap food is not actually cheap. It’s just that a portion of its cost is being paid for at someplace other than the supermarket checkout. Our taxes, for example, fund the billions of dollars in subsidies–mostly going to the largest farms–for commodity crops like corn and soybeans, whose by-products can then serve as cheap ingredients for processed foods. Our ever-increasing health insurance premiums pay the bills for the diabetes and obesity epidemics caused by high-fructose corn syrup and other refined sweeteners. Other costs are being substantially passed off to future generations. The current-day farm practices which are causing our agricultural soils to erode away ten times faster than they can be regenerated will mean less farmland from which our grandchildren will be able to feed themselves. And, the burning of fossil fuels to transport our food thousands of miles from farm to plate will result in an outsized burden for our descendants as the effects of climate change further unfold. These are the kinds of “externalized costs”, as economists call them, which constitute the unfair advantage of corporate, industrial food. (Regional, organic food has such costs, too, but to a far smaller degree.) Until eliminated, this advantage will continue to stymie efforts to fundamentally change the food system. And yet, those working on a local/regional scale–as opposed to a national scale–are not going to be able to change this equation. This is where we need the Occupy movement. There are, of course, the more everyday tools for effecting national political change–lobbying, petition drives, electoral campaigns. And, use of such tools has yielded some progress, as illustrated by programs in the Farm Bill promoting local food and conservation (as limited as they may be). But, as I see it (and I’m clearly not alone), not enough progress has been made. The problems of our food system are serious and urgent, and the ever-increasing influence of money in politics makes the prospect for serious change by everyday means very slim. Our food system needs a non-violent, direct protest movement that views our society’s challenges in a systemic way and demands serious change. The kind of change that would mean an end to the excessive advantage and influence held by corporations in our food system–and in our society as a whole. Our food system needs the Occupy movement. There is a second reason why our food system needs the Occupy movement. If we are to finally succeed in stripping the big corporations of their unfair advantage–the ability to pass off to society the social and ecological costs of their activities–then most of us are going to find our food costs increase. Having learned just how expensive “cheap” industrial food really is, we will have substantially switched to healthy, organic, regionally-produced food. The price on that delicious tomato from the organic farm down the road will finally beat out the price on that pale, sad excuse for a vegetable (or fruit, to be precise) flown in from who-knows-where. But the local, organic tomato will still cost more than the industrial version used to cost. For many people–I would venture to suggest the clear majority of Americans–this will be a manageable adjustment. It will require a re-alignment of expectations about the percentage of household income spent on food: perhaps Americans will end up devoting closer to 24% of income on food as we did in the 1920s, up from the 9% we currently spend. Many millions of Americans, however, will be able to handle this–especially when one considers all of the societal costs which will have been avoided (societal costs, of course, eventually translating into individual costs like taxes and insurance premiums). Still, a substantial number of Americans will not be able to afford higher food prices. Many of them cannot afford food even at current prices. Thus, what is already an imperative will become even more critical: that access to food be made a right, rather than a mere privilege. Every person deserves to be able to afford to eat healthy, nutritious food, and we as a society need to figure out how to make that an assured reality. This is not something that those involved in local efforts to change the food system can do much about. Communities can develop good food pantry networks or organize fundraisers for low income shoppers at farmers’ markets, but they’re in a poor position to institutionalize food as a right. The Occupy movement, however, can help get us there. Just as with corporate advantage, this is not a challenge that is likely to be overcome by everyday petitioning and lobbying efforts. Establishing access to healthy food as a right will come only as part of a bigger societal shift. And, such a shift is precisely what the protesters at Occupy Wall Street have been talking about from the beginning. As stated in their Principles of Solidarity: “We are daring to imagine a new socio-political and economic alternative that offers great possibility of equality.” This is about moving toward a society in which it is not just the 1% that are guaranteed to eat. 100% are guaranteed to eat. If, then, we are to build a truly new food system, I suggest this: Let us be engaged, wherever we are able, in that much-needed work of creating a better structure from the ground up–buying local/regional, starting or supporting small farms and food businesses, developing community gardens, joining support organizations. And in our broader-scale efforts, may we not give up on the standard citizen tools of the political process (letters, petitions, etc.). But at this moment, let us also give serious consideration to how we can best support and participate in the Occupy movement and help to chart its future direction. After all, we are the 99%. It’s our movement, too, regardless of whether or not we have yet joined a single street protest. This is a moment with great potential to effect serious social change and move us toward becoming a more equitable and sustainable society. May we make the most of it. In lower Manhattan and in cities and towns across the country, thousands of people have taken to the streets to demand change. We are the 99%, they are saying, here to put an end to the societal injustices perpetuated by the 1%. Those occupying Wall Street and elsewhere are speaking out against the concentration of corporate power and its negative impact on people and ecosystems, including problems ranging from joblessness and lack of access to health care to loss of biodiversity and accelerating climate change. Meanwhile, in western Massachusetts, a small crew is hard at work inside a solar-powered food processing facility, peeling and shredding cabbages freshly harvested from an organic farm ten miles away. 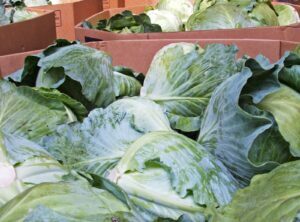 The cabbage will ferment for several months, and then be sold as raw sauerkraut to stores around the Northeast. Occupying the streets. Making organic pickles. Any connection here? I would say so. At first glance, what happens here at Real Pickles appears to be merely ordinary business activity. Just a small enterprise trying to yield a reasonable profit by producing food for people. An observer not so familiar with the workings of contemporary America might be tempted to think it normal, as well, that we source our vegetables from a small organic farm down the road, generate our own power, sell our pickles in raw and fermented form, and only distribute within our own region. But of course, in 2011 here in the United States, there is nothing ordinary at all about such practices. Nor is it typical these days for people to be eating food produced by a small business. While the representatives of the 99% are seeking to occupy Wall Street, we should probably be thinking of the 1% as the real occupiers. Climate activist Bill McKibben, in a recent address to the demonstrators in NYC, noted: “Wall Street has been occupying the atmosphere. That’s why we can never do anything about global warming. Exxon gets in the way. Goldman Sachs gets in the way.” Indeed, Wall Street has long been occupying many realms of our lives. And our food system is a prime example. Local food production and distribution by small businesses certainly used to be the norm. But these days, our food system is primarily national and international in scale. It is dominated by huge corporations with massive influence over what we eat and how it is grown, processed, distributed, and sold. These companies have spent significant sums of money to convince us that there is nothing wrong with this picture. Monsanto’s public relations message is that we need them if we are to “feed the world”. Kraft Foods assures us that they’re there for us, “fighting hunger and encouraging healthy lifestyles”. Increasingly, however, people are starting to see through the slick PR campaigns. They are starting to see connections between the corporate control of our food system and a wide variety of societal problems – the diabetes and obesity epidemics, the huge “dead zone” in the Gulf of Mexico, and ever-increasing greenhouse gas emissions, just to name a few. Indeed, I think the evidence is robust and convincing enough to say quite clearly: A global, corporate-dominated food system has profoundly negative consequences for people and ecosystems. We are, without a doubt, in need of a new food system. Here, then, lies the connection between Occupy Wall Street and a business such as Real Pickles. Among the Wall Street protesters, some are more radical than others in their demands for change. But there appears, by and large, to be a unified determination to alter the balance of power in our society away from the corporate elite and in favor of the 99%, and thereby begin to remedy a long list of social and ecological problems. At Real Pickles, we are doing essentially the same work. Having recognized that a corporate-dominated food system does not serve our society well, we have set about helping to build a new one. Real Pickles is small, people-centered, ecologically-conscious, and local/regional in scale; and puts out food that is authentic and nourishing. The aim is that this business will serve as a model as our new and better food system emerges. Just like those protesting on Wall Street, we also recognize that the problems stemming from corporate control extend far beyond the food system, and hope that our work has impact as part of a broader re-shaping of our society, as well. Occupy Wall Street and Real Pickles represent different approaches to the same effort. Many approaches are needed, as there is much work to be done and no one simple path to an equitable and sustainable society. So, it is with excitement that we witness the latest social ferment on the streets. Here at Real Pickles we love fermentation! We fully support the Occupy Wall Street protests and are delighted to be engaged together in the work for a better world.